To make it easier we have broken down the reviews by budget and type so you can find the perfect fit, you can use the links below to jump to the reviews that match your requirements or read through all of reviews and maybe find something unexpected. The Best Coffee Makers Available? Why buy your next bean to cup coffee machine online? 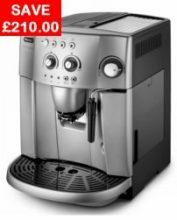 For the price, the DeLonghi Magnifica ESAM4200 is one of the best bean to cup coffee machines available and our favourite, all things considered. The DeLonghi Magnifica ESAM4200 is an automated bean to cup coffee maker that offers an impressive range of features for the dedicated fan. Not only does this machine grind coffee beans in order to produce a rich, vibrant flavour, but it also offers you plenty of customisation options to help you tailor every inch of your drink (e.g. temperature, strength, etc.) to fit your tastes. If you want to spend a little less money but still have one of the best bean to cup coffee machines in the mid range price bracket then the Andrew James is definitely worth a second look. Coffee is at its best when it has been freshly ground and brewed by you. With the Andrew James filter coffee maker and integrated grinder, your drink is made for you from bean to cup in a matter of minutes and is ready whenever you are thanks to the built-in 24 hour programmable timer. Find best priceThe integrated grinder allows you to simply add fresh beans and water and then the machine does the rest of the work for you. It grinds the beans, filters and produces delicious drinks quickly and smoothly. Currently the best machine on the market in the budget price range. This pod coffee machine is an excellent example of great coffee for a great price. The Delonghi NESCAFE Dolce Gusto Mini Me is stylish and compact, but don’t let its size fool you. With a maximum 15 bar pump pressure it is able to create drinks with full bodied flavour and a silky crema finish. The end result is designed to be just like you would enjoy in your Costa or Starbucks. The capsules are sealed once the roast has been ground to deliver to you a full flavour and attractive aroma. With a wide range of drinks to choose from including ground and roast coffees, hot chocolate drinks and Costa and Starbucks specialties, this pod coffee maker will soon be your most valuable friend. If you are looking for the best barista at home experience, the models below are truly amazing and as such the price is premium too, but you really do get what you pay for here and there is no other way of getting the bean to cup coffee shop experience and taste at home. Remember, clicking on the ‘Best Price’ button will give you the latest price on Amazon where you can see if there are any discounts going and compare their reviews as you make your decision. This is an absolute gem of a bean to cup coffee maker on the market today in this price range. Be your own barista and create amazing tasting coffee to rival the finest cafés. The Dual Boiler™ is for the true coffee lover who wants to manage every step in the espresso process. Just like with a professional barista shop machine, you can make your espresso and at the same time, froth the milk, which allows you to make perfect drinks by having both the milk and the expresso ready at the same time. If you want to spend a little less money but still have one of the best bean to cup coffee machines in your kitchen the Melitta Caffeo Bistro is an excellent choice. The silver Melitta Caffeo Bistro Automatic coffee maker immediately has the appearance of a professional machine with its bulky shape, sleek controls and the sizeable looking milk frother attached to the side. This machine would fit right in to Costa or Starbucks as much as the average home kitchen. With its tough grinder it can create coffee from bean to cup for two different users at a time and guarantees “variety for coffee lovers” through a variety of drinks at a consistently high quality. 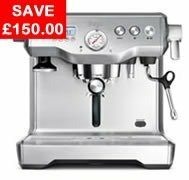 For the price, the DeLonghi Magnifica ESAM4200 is one of the best bean to cup coffee machines available and our favourite, all things considered. The DeLonghi Magnifica ESAM4200 is an automated coffee maker that offers an impressive range of features for the dedicated fan. Not only does this machine grind beans in order to produce a rich, vibrant flavour, but it also offers you plenty of customisation options to help you tailor every inch of your drink (e.g. temperature, strength, etc.) to fit your tastes. Heston has done it again, but this time creating on of the best bean to cup coffee machines available today. Create great tasting espresso – from bean to cup – in no more than a minute. The Barista Express allows you to grind the beans right before extraction, and its interchangeable filters and a large range of automatic or manual operations ensure quality, professional results quicker than you can drink! Dose-Control Grinding. The integrated conical burr grinder with dose control delivers the perfect amount of coffee on demand, ensuring maximum flavour. Its adjustable grind size and dose let you customise to suit your tastes. These machines really are extremely good and some of them give the premium machines a run for their money. I highly recommend checking out a couple of these, even if you are looking for premium options and if you are on a limited budget you will not find better than below. Remember, clicking on the ‘Best Price’ button will give you the latest price on Amazon where you can see if there are any discounts going and compare their reviews as you make your decision. The Russell Hobbs Platinum Grind and Brew Coffee Maker brings style and flawless performance to any kitchen. The Grind function allows you to effortlessly grind your beans from fine to coarse to maintain the quality of bean to cup coffee preparation. 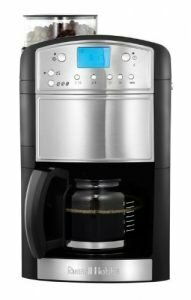 This model also features a digital programmable control so that you can set your coffee to be brewed at any time of day, not to mention strength selection to suit your tastes. To add to its stunning looks, the Grind and Brew has a classy blue LCD display, 10 cup glass carafe and for ease of use, includes a permanent, removable filter. Find best priceThe integrated grinder allows you to simply add fresh beans and water and then the machine does the rest of the work for you. It grinds the beans, filters the brew and produces delicious flavours quickly and smoothly. 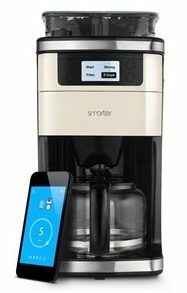 The Smarter Coffee machine is a a leap forward in beverage making technology, giving you delicious, fresh drinks from the tap of button, anywhere you can get a wireless signal in your home. Available in 3 colours, (Black, Red or Bronze), the removable panels included in the box enable you to choose the right colour to suit you and fit your kitchen. The control panel also allows you to use Smarter Coffee in person if your phone isn’t nearby. Grind and brew fresh beans any time, by just pouring in your selected beans, choosing the coarseness of the grind then starting directly from your smartphone or control panel. Before we get to our next category, you might be interested to take a look at our Krups coffee maker guide where you can find reviews and video guides on all things Krups coffee, from machines to grinders. It is new and we hope you like it. If you are looking for the all in one solution, these machines do exactly what it says on the tin, load them up with beans, choose your options and press the button. Considered to be the best machines in the world, the same standard as what you get in Costa, Starbucks or your local shop. Remember, clicking on the ‘Best Price’ button will give you the latest price on Amazon where you can see if there are any discounts going and compare their reviews as you make your decision. 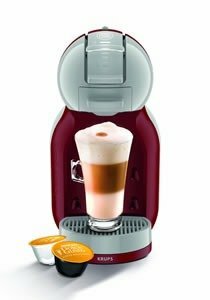 You can find partial and full reviews of the best bean to cup coffee machines further up the page or click here to see the full list. Pod or T-disc machines are really simple to use and do exactly what it says on the tin, i.e. you put a pod in, press the button and the machine makes your drink via the pod. Very simple and quick to use. Because of this, they are the ultimate no mess, no hassle drinks makers because everything they need, except water, is provided in each pod. You simply choose the flavour you want from a wide selection of pods, stick it in and press the button. Job done! You can find partial reviews of these machines further up the page or click here to see the full list or take a look at our special Pod Coffee Machines – January 2019 Guide. You can find partial and full reviews of these filter coffee makers further up the page or click here to see the full list. 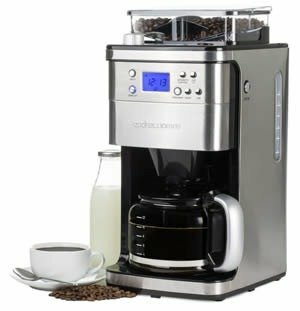 You can find partial and full reviews of these espresso coffee makers further up the page or click here to see the full list. Are you searching for an espresso maker? If yes, it doesn’t matter whether it’s your first, second, or third because finding the best one can be a daunting task regardless of how many espresso machines you have previously had. As you may know, that’s because you need to go through a plethora of espresso makers, check prices, compare features, and finally, choose an espresso machine that can be a huge disappointment. 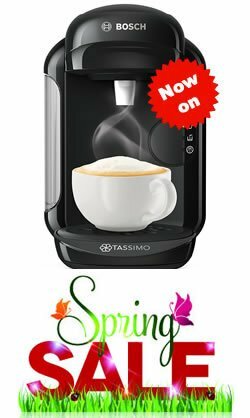 Now, if you’re wondering how you can find the right espresso coffee maker, you should know that the answer doesn’t lie in any of the espresso maker reviews available over the web but in this buying guide, which can help you understand the secrets behind choosing an appropriate espresso coffee machine for you. There are numerous brands of espresso makers, with prices ranging from $20 to more than $1,000. These machines are divided into different categories, such as stovetop models, moka, electric-pump makers, steam machines, and everything in between. 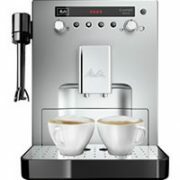 You can also find manual and automatic espresso coffee machines, which address different needs and demands. While a manual version permits you to control the entire brewing cycle, the automatic version can grind beans, make coffee, and even collect used grounds in a bin by itself. Some espresso machines employ pods or capsules, which come along with measured, pre-ground coffee portions that ease the entire process of getting a fresh and delicious cup of coffee whenever you want. Unfortunately, the wide variety of espresso machines will test your patience, knowledge, and discernment before allowing you to get one that matches your preferences. So, you better get ready for this! Beam Grinder: To get a fresh, flavorful espresso, you need properly ground coffee. The best espresso makers will always have an in-built grinder, which delivers the right grind to improve machine’s efficiency and coffee quality. Water Filters: The latest espresso machines have integrated water filters that take out iron and chlorine from the tap water. Although this is a nice addition, it implies extra cost and maintenance. Pre-Moistening Cycle: This is another great feature that you should look for when buying an espresso coffee machine. Although there are many different names for this technology, it basically does a simple thing; namely, it enhances the coffee taste by moisturizing grounds and stimulating aromatic oils before pulling the coffee. A good espresso maker can be quite expensive. However, if you choose wisely, you’ll not only get a high performance machine, which allows you to have your favorite coffee at any time of the day, but also save money on your daily mochas. That being said, buying one of the top espresso makers is really worth it, especially if you’re a coffee lover. Do your research. There are so many types of machines out there that it can seem like a daunting task trying to figure out just which one is right for you. Take the time to look through your options: read the specifications for the different machines and make sure that you think not just about the basic features, but also the extras features fitted. Check installation and warranty information. Most machines should come with an instruction manual, however some also include installation in the price of the machine, having someone come out and install the machine for you can save time and hassle, particularly if you are buying a complex machine like the Sage by Heston Blumenthal the Dual Boiler. Tip: Also make sure that you get a decent warranty, it is likely to be an expensive piece of equipment, so it is important that you are covered if anything goes wrong. Follow these three basic rules and you will be well on the way to finding the best bean to cup coffee maker to fit your exact requirements. Good luck! When you buy a bean to cup coffee machine you want to get the most reliable machine which produces the best quality drinks and of course you want this at the lowest price! These days it tends to be easier to buy online rather than taking the more traditional route of buying from a catalogue or in person on your local high street: buying online is faster, easier and you can access all the information you need to make an informed decision and buy the most suitable machine for your exact needs and requirements. There are several different types of machines on the market, the main types being traditional filter, espresso, pod or capsule and automatic bean to cup machines. On top of this, different machines come with different features and extras, so it is important when buying that you know exactly what you are looking for. That sounds obvious but far too many people don’t really know what they want and only realise after they have had their new purchase for a few weeks which is a bit late by then. What type of machine do you need? Our review shows that pod coffee makers are ideal if you want people to serve themselves but if you are going to serve them personally, you might want to look at an espresso or filter machine. If you are buying an espresso machine, how many cups are you going to need to make at once? Budget machines make only one cup at a time, however there are machines that enable you to have six or more cups on the go which is perfect if you are going to need to cater for large numbers of people simultaneously.